At first glance, it doesn't look like much work went into the Chinese flag. Simple red backgrounds with a few yellow stars were all the rage among mid-20th century communist nations, and China was just following suit - right? In fact, today's Chinese flag was just one of many - of thousands - in competition to become the nation's banner. When the flag was being decided upon, it actually would have been a good move to be against the "big yellow star surrounded by four smaller ones" design, as it wasn't the one preferred by Mao Zedong himself. During the Civil War, the Communists had fought under the flag of the Chinese Communist Party - a copy of the iconic Soviet flag, with a yellow hammer and sickle atop a red background, but without the Soviet five-point star topping the sickle. But that was the flag of the Party, not of the nation (a distinction that, while sometimes blurry, does exist). So when the war came to a close, the Communist forces realized that they needed a national flag to celebrate the founding of the People's Republic. And so, in 1949, the Communists held themselves a flag contest. The People's Daily, along with a number of other popular Party mouthpieces, announced in July that the public was invited to submit potential designs for the nation's new flag. The flag designs had to be rectangular (easy enough), should be primarily red (for China and for Communism), should have "Chinese characteristics" (reflecting the geography or history of the country) and should exude power (of the Party and the working class). Many of the mock-ups featured the Chinese character 工 (gong, meaning "work" or "worker") while others include the classic hammers, sickles and stars. This would have been a good call because, as the official news website of the Communist Party explains, it was Mao Zedong's personal favorite. Mao eventually came to agree with Zhang, and decided against the Yellow River flag (and also a similar flag with two yellow stripes, representing both the Yellow and the Yangtze Rivers). In late September, 1949, Mao and Co. finally decided on a design - sort of. Designed by Zeng Liansong, this specimen was a bit basic compared to the more eccentric samples above, but it did the job. Red? Check. Power? Check. Chinese characteristics? Sure, why not. Rectangle? Hell yes. Even Zeng's relatively simple flag has an illustrious back story. The large yellow star represents the Communist Party, and the four smaller stars represent the social classes within the country, as described by Mao in his On the People's Democratic Dictatorship (read that here, if you dare). Those classes were the workers, the peasantry, the urban petite bourgeoisie and the national bourgeoisie. Today, the flag is sometimes misinterpreted to represent the five largest ethnic groups of the country, but that is propaganda by the wretched revisionists. Some balked at the idea of including the bourgeoisie on the flag - they probably would have preferred that they be illustrated by the poo emoticon instead of a star - but the design eventually held its own against criticism. The only adjustment made to Zeng's original design was to remove the hammer and sickle from the principle star - the design was seen as too close to the Soviet Union's and, after all, the star itself represented the Party, which was enough Communist symbolism already. The official flag was finished just in time for the October 1, 1949, declaration of the founding of the People's Republic. According to Communist myth, the flag was only sewn the day before, by the seamstress Zhao Wenrei. In less than 24 hours after Zhao finished sewing, Zeng's flag was hoisted above Tiananmen Square, proudly declaring the founding of the nation (even for the bourgeoisie). Zeng reportedly received RMB5 million for his work - a sum which, thanks to the precarious state of China's currency at the time, is almost impossible to translate into an exact modern value. He went on to become a member of the Chinese People's Political Consultative Conference (the CPPCC, or "China's Congress"), representing Shanghai. Alive well into the 1990s, Zeng Liansong became something of a folk icon - a cigarette smoking, flag-designing old man, who was frequently rolled out for public events in Shanghai. He died in 1999, at the age of 82 - but his five classy stars still shine bright above the People's Republic. 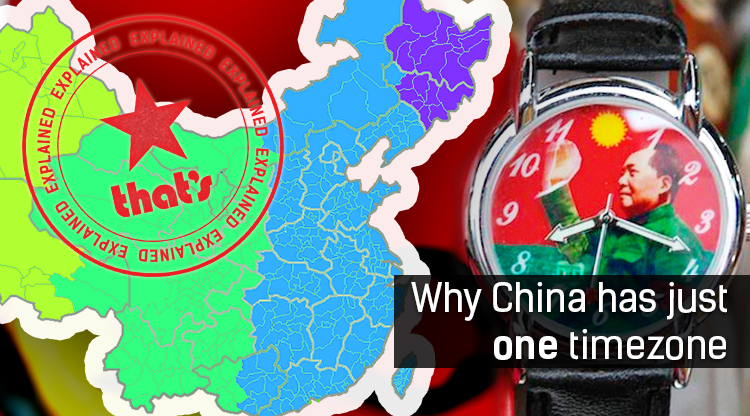 Explainer: Why Does China Only Have One Timezone? What a long, mutation-filled trip it's been. Typhoon trifecta kicks off a potentially record year for the Pacific cyclone season. This is not going to go over well in Beijing. See the rise and fall of all world empires in a single chart.